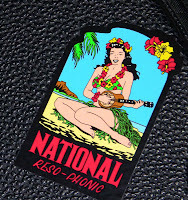 I’ve brought a brand new National Reso-phonic NRP metal ukulele with me to Australia. The down side to bringing a new ukulele down-under; no stickers on the new hard-shell case! So, in an effort resolve this untenable situation, I’ve instituted the Great Australian Hard-Shell Ukulele Case Sticker Project. At each stop along the way on my three-month journey I will attempt to acquire a new sticker for my case that in some way reflects my locale. At the end of the tour I’ll post a fabulous time-lapse video montage of the case’s transformation. 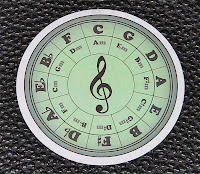 With any sticker project the first and most important sticker is the Instrument Identification Sticker, it’s obvious purpose stated in its title. These type of stickers can most often be obtained from the manufacturer. Next in the line of sticker hierarchy, in my opinion, is the Circle of 5ths Sticker. In a uke jam and someone calls out a I-VI7-II7-V7-I chord progression in the key of Db? No problem with a circle of 5ths sticker prominently displayed on your case. Finally, when starting any journey, it’s always a good idea to know the jumping off point for the excursion. The International Airline Excursion Sticker can be obtained from any major international carrier after claiming your checked luggage at said destination. Sticker Project. Remember, above all, when placing stickers on your case use the slightly ascue method (except in the case of circular stickers). In later posts we’ll also discuss the finer points of feature sticker placement, sticker over-lap, and thematically developed motifs.